"To Be Young, Gifted and Black: A Portrait of Lorraine Hansberry in Her Own Words"
Adapted by Robert Nemiroff, “To be Young Gifted and Black” is the Lorraine Hansberry’s story in her own words. The play addresses themes of identity as well as the journey one must take to find their voice and place in a society full of trials and tribulations; common themes which constantly occur within the African American community. African-American history is often neglected and unknown, therefore, this play is being produced with the hopes of educating people in and outside the African American community; raising cultural awareness of the struggles African Americans face daily, as well as to help stitch together the African American diaspora history by acknowledging those that paved the way for today’s community. It is a place to start dialogue throughout Santa Cruz, and to bring the African American diaspora together. Angry, loving, bitter, laughing, and defiantly proud, the story, voice, and message are all Lorraine Hansberry’s own, coming together in one of the major works of the black experience in mid-century America. My name is Brandie Bowen. When I am not on stage or working with my AATAT family for this play, I am trying to get through a Sociology/Community Studies major as a 2nd year at Oakes. This is my second AATAT production and I am so honored to see yet another show come full circle and witness such a dynamic piece come to life. I am Brenda Covarrubias. It is an honor and blessing to be a part of AATAT for the first (and last) time. I am unfortunate to be able to give some of my time to CAD and to the beautiful people who make this happen. Thank you for all of the amazing opportunities I have been given. AAATAT! My name is Jewell Long Hayes and I am a 3rd year history major with a concentration on Africa and the Americas. I was a part of theater in high school but the energy and play selection of AATAT is amazing and I just had to be a part of this family. I would like to thank my friends and family as well as the Holt family. 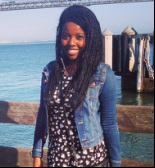 Hello my name is Nikole Hill, I'm a 3rd year transfer student studying Cultural Anthropology. This will be my first time performing with AATAT but it will be my second play of the school year. I am very excited to be both a part of AATAT and a part of this play. I hope everyone enjoys the production as much as we will enjoy putting on a show for you. ﻿Hello. My name is Brian Jackson, I am from Washington D.C and I am a 3rd year majoring in Latin American and Latino Studies and Politics. I enjoy traveling, dancing and learning about other languages and cultures. My name is Keyarea Jones, I am a first year at UC Snta Cruz and this is my second production this year. I am majoring in Human Biology with a minor in Theater Arts. My name is Justin Sugar. This is my second year at UC Santa Cruz and this will be my first production of the year. I'm really excited and plan on making my cast proud. My name is Shawn Heron. I am a 2nd year sociology major. This is my first year participating in AATAT and I am very excited and can't wait to put on a good show. My name is Jack Stewart and I'm an art student at UCSC. I am interested in exploring every aspect of the arts and helping others unlock and embrace their creative potential. Hello my name is Sapphire Lair. I am a 1st year majoring in Human Biology. This is my first year involved with AATAT and I am so excited and appreciative of the chance to act and learn from those around me. Thank you everyone for coming to support our production and I hope you all enjoy it! Hello my name is Jessica Malbrough. I am a transfer and I am very delighted to be acting once again. Please enjoy the show and never forget that God has given gifts to everyone you just have to find yours. I am Mikayla McGill. I am a sophomore double majoring in sociology and art. I am so happy to be involved in AATAT this quarter. Thank you for supporting us! Hello Everybody! My name is Jessica Jones and I am a fifth year literature, film and digital media double major. To the AATAT family, I love you all so so much and I can't imagine being where I am now without you. Enjoy the Show! My name is Jacqueline Moore and I am a freshman. I am very excirted to be a part of AATAT for the first time and to be working with such talented individuals. I hope you enjoy our show. My name is Dominik Alora Muro and I am a 2nd year Feminist Studies major at Oakes College. My biggest goal in life is to continue doing amazing things with programs like AATAT and I hope to inspire a cultural revolution. Dominic Calhoun: I am a 4th year, Africana studies major. I love delving into performing arts and cultural competency through the arts. I plan on making tremendous social change in our youth through theater in urban communities when I graduate. My name is Lupita Sanchez and I am the dramaturg for this AATAT season. Glad to be working with such beautiful and talented people! Enjoy the show! My name is Miguel Sarabia and I am affiliated with Stevenson College where I am able to experience the magic that Mr. Williams brings not only to AATAT but to the theater department as a whole. I hope to learn the ropes of workin behind the scenes so one day I will be just as influential as Mr. Williams. Hi my name is Dexter Henderson. I am the ASM for this production. The End. Hello, I am a third-year theater arts major and dance minor named Kristofer Bumanglag. I am both honore and humbled to be a part of AATAT this year. My name is Devinne Vaughn, hailing from Central California, I am a third year Anthropology major who loves to get my creative juices flowing through theater! I hope to bring a little color and life to the stage this AATAT Season. Hello my name is Jeffrey Sosa, and I am a first year at Kresge. My intended major is Business Econ. I like to have fun, but I might be shy at first but that will pass with time. I hope to be professional and at my best for this upcoming performance. Hi, I am Miguel Angel Hernandez, I am a 2nd year majoring in Sociology and Art to portray the knowledge and beauty of our ancestors in order to reunite our communities and make it a safe environment. I am very excited for the outcome of the play and wish you enjoy the hard work that AATAT family has recreated for us all. I am a 2nd year affiliated with Oakes college majoring in Psychology with a minor in Education. I am excited to be a part of the AATAT family once again and look forward to being a part of a very talented and creative cast and crew. I hope everyone can see all of our hard work and enjoys the show. Hello, Hello. My name is Tianna Bratcher, I am a freshman and planning on being a double major in psychology and literature. I enjoy very long walks in the grocery store and I hope you enjoy our show. My name is Noah Brown and I am freshman. I am thinking about majoring in Theater Arts and/or Computer science. This is my first performance at UCSC and I look forward to being in future productions here. Hi everyone I'm Precious Wingo and I am so blessed to have had the opportunity to work with Mr. Don Williams and the Cultural Arts and Diversity Resource Center. Hello everyone! My name's Taylor Griggs, I'm a third year politics major from Oakes college and your AATAT secretary! Congrats to our cast and crew for your hard work and for a wonderful season! I am Dondre (Dre) Coleman. I'm a 4th year Theater Arts major Education Minor. This is my 3rd year being involved in AATAT and I am thrilled to be back. I play the roles of Father, Monasse and Tsembe. I hope everyone enjoys this production. Stay humbled my friends. They call me Brandon Melendez. I'm a 2nd year student at Oakes College and double majoring in Theater Arts and Classical Studies. I am truly blessed to be a part of this space. I really do hope the audience enjoys this year's show and appreciates all of the cast and Tech Crew's hard work. AATAT! My name is Danielle Luna. I am a 3rd year legal Studies major/Sociology minor and possible theater Arts minor with a concentration in design. this being my second year as a part of AATAT, I can't be more proud to put my own little touches in this show and I'm excited to see what it has to throw at me this year.